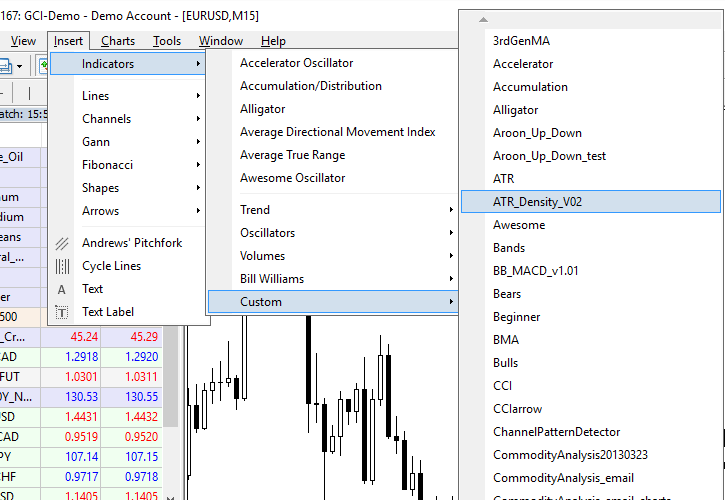 Update 2016-05-09: The tutorial has been completely revamped to reflect the most current and easiest way to install new indicators in MetaTrader — both MT4 and MT5. 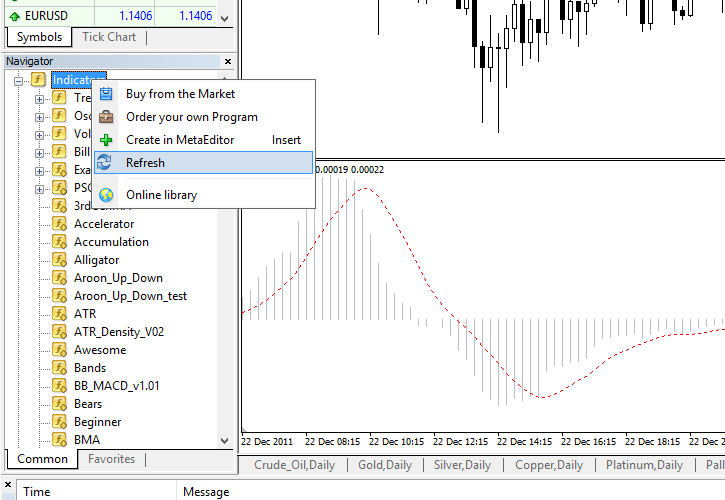 This tutorial covers indicator installation for MetaTrader 4 and 5. Since MT4 Build 600, there is no difference in the way it is done in the two versions of the platform. There are many free MetaTrader indicators available online, but some people still encounter problems in attaching these indicators to a chart or compiling them. This simple tutorial was created for those who want to learn how to install custom MetaTrader indicators. The process is quite similar to installing a new expert advisor, but there are some differences. 1. Download custom MT4/MT5 indicator and save it anywhere on your PC. 2. Launch your trading platform. OK. Now you can enjoy your new MetaTrader indicator and hopefully — better Forex trading results. If you have any questions about installing custom indicators in MetaTrader, please free to ask using the commentary form below. What a strange error. Maybe your MT4 wasn’t installed properly. Try re-installing it or download it from a different broker. You’re confusing people by giving them too much information by telling them they have to install mq4 files and then open the editor and compile them. The platform will do this automatically when the mq4 file is used for the first time. Yeah, but if there are compilation errors in the code they won’t even know it. Compiled a mq4 with no error, but where’s the ex4? don’t see it showing on my custom indicator column? Did you put it in experts/indicators folder? Did you restart MT4 after compiling it? Thank you for the indicators and the valuable information that you have provided on your website. I tried installation of the fisher indicator you have provided on your website for the MT5 platform, however was not able to get it to work, infact I wasnt able to see it in my Navigator column. Could you please let me know how once installs it on the MT5 platform. Thanks in advance. You don’t need to open any files. Just unzip them into experts\indicators\ folder of your MetaTrader 4 terminal folder and restart MetaTrader. But, judging from your description (the type of files isn’t recognized), you don’t have MT4 installed. And you won’t be able to use any of MT4 indicators without installing MT4 platform. It work for me really well,thanks man! I am glad that it’s useful. I followed the instruction and I can see the price alert ea in the navigator box but I cant drag it into the chart to set price alerts, can some one please help me? Not sure If I’m doing it right. Thank you! Actually you shouldn’t be seeing an EA, because it’s an indicator. Are you sure that you’ve copied it to “experts/indicators” folder of your MT4? pls i can not be able to install this fisher indicator pls, i need easy procedure that it can thought me easily frm begining their insallation.pls i need the indicator urgently. What step you can’t understand? Does my computer need to be switched on for it to operate? If I want it to trade with comp switched of do I need to set my entries before I shut down? It won’t work if you turn off your computer. You should use VPS hosting to host your MetaTrader platform with an expert advisor if you want it to work with your own computer switched off. How can i attach alert to beginner? Seceondly, I find that beginner triger after the seconld bar , is that how it works? I did what you instructed. It compiled with no error, but still it does not attach. what should i do next ? What do you mean “does not attach”? What happens when you try attaching it? I copied the file to the indicators folder. When I press compile it just says compiling but nothing happens. It doesn’t create the ex4 file. Are you sure that you are compiling the file you’ve copied to indicators folder and not the one that is in some other folder? When I tried to change the file in other folder it created the .ex4 file. In indicators folder it does not even change the date of the modification when I modify the source file. I copied the .ex4 file from other folder to the indicators folder and this solved the problem. This is the first time I have ever used MQL editor and within a few minutes I was using the indicator on my charts. Thanks so much. You are welcome! I hope it wasn’t the last time too :-). same here….Thank you so much…. we can only try….cant we?? How must I install dotted indicators in iPad? I already installed MetaTrader4 Platform now I only need to install dotted indicators(red & blue) How must I perform this as I tried and I downloaded a zip folder but it ddnt work. Custom indicators do not work on iPad version of MetaTrader 4. I have just installed the latest version of the Lot Size Calculator & NO pairs show the “ASK PRICE” – is that correct? What is Lot Size Calculator? Yeah, it works fine. accurate indeed! but, I just have a problem. If I wanted deleting the indicator from a chart, its not highlighting. How do you do that? You can always press Ctrl+i and delete indicator from the list. ¿Con qué periodicidad utiliza el Market Profile? Trabaja sólo con M5, M15 y M30. Is there a way to introduce the Position Size Calculator on every chart and is it possible to store the calculator on the tool bar? Do you mean “with one click”? As far as I know, no. The best you can do is to save a chart template with this indicator on and apply it to different charts. how do I save it if I am using window8. I can’t find the program files in win8.any suggestion? When I right click on an indicator to “save” in does not give me the option to save into the c drive local disk section. Try right-clicking the download link and choosing “Save Link As” then browsing to your /experts/indicators/ folder. 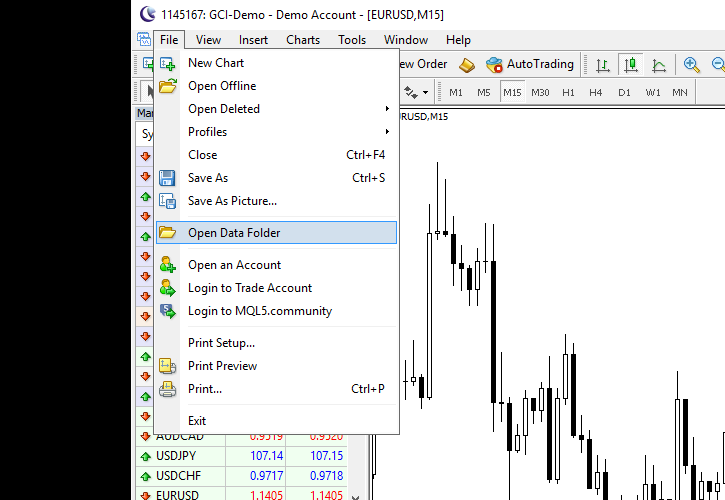 Then open your Downloads folder and copy the indicator to your MetaTrader’s indicators folder. What do you mean by “does not accept it”? So, what happens when you try to paste it? 1. There is no “Paste” option on the right-click menu? 2. You click “Paste”, but the file does not appear there? 3. 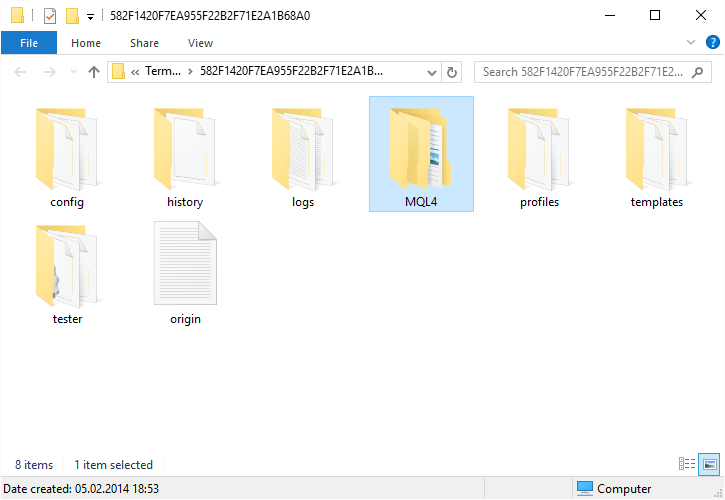 The file appears in the folder, but is not present in MT4? I think the easiest way around this for me, is if you to show me how to cut and past an indicator in the mt4 platform, step by step. I haven’t done this before and I seem to be lost. Your kind assistance and time is greatly appreciated. Doesn’t this tutorial (above) show just that? The instructions show where and how to find the downloaded indicator in the Local Disk C then go to Programme Files then Broker etc. etc. until you install the indicator onto your mt4 platform. My problem is that when I download the Indicator I cannot save it into my Local Disk C but instead goes straight into the download section and this seems to be my problem. My indicator download goes right in the download section and I cannot find a way to move it from there into the Local Disk or the indicator section of the mt4. I have tried all your suggestion above and it does not work for me. Maybe I am doing something wrong when downloading the indicator. Do you know where your Downloads folder is? Can you open it and find the indicator there? What browser/plugin are you using to download the indicator? Yes, I can see it in my download section. I am using the internet explorer browser. Yipppeeee at last I got it. I can’t thank you enough for your time and patience in assisting me with this indicator download. MT4 was closed when i did the compilation. Any thoughts on how to get this to compile correctly? Is it an error or just a warning? An .exe file is initially created in experts/indicators folder after the compilation but when MT4 is opened, the .exe file disappears (is deleted?) and a .txt file replaces it in the folder containing the same warning message. Do you see MarketProfile under Custom Indicators inside MT4? Warning message is OK. It should not cause any problems. I’ve checked the Custom Indicator list in MT4 and Market Profile is not listed? Now that’s strange, because that warning is normal and shouldn’t prevent compilation. Try copying it to MT4 installation of some other broker. Strange is a good word! I’ve loaded Market Profile onto another broker MT4 platform with no problems. Went back to my current broker MT4, cleared the original files, followed the same process to re-load the file in experts/indicators, compiled with the same warning message, and now it’s working fine. Thanks again Andriy for your support and patience. Btw, which country are you based in? I am glad that you have solved this problem. I am based in Ukraine. Kiev, L’viv, Odessa??? Ukraine is blessed with many treasures (which are mostly kept secret from foreign travelers). But that’s another discussion! great, your post is my saviour after struggling to install indicators. Yes, you need to compile mq4 to ex4, but considering that you have that indicator in the list (you said you drag it to the chart), it is already compiled. Perhaps, the indicator is visible only with its template. Try loading template instead of adding the indicator: Right click on the chart->Template->Load Template. Thanks so much, i was able to compile it and it reflected on my chart. but how do i use it to calculate my lot size before i even place the trade. that is what i need it for. It would help to know what you are talking about. The indicator is install and on the chart but I don’t see any lines… and solutions for this. Which indicator do you mean? Nice trend I gues it helps slove my problems..I downloaded 2 indicators 1 of them was an mq file nd I moved it to my mt4 indicators..nd d 2nd was an Ex file did d same it showed up bt wen I tried to attach to chat it dint show up..how u sugest I convert to mq file ? Tnx admin.. There is no need to convert ex4 file to mq4 (besides, it is not possible). mq4 files are compiled into ex4 and then can be attached to the chart. If you already have an ex4 file and nothing happens when you attach it to the chart, then I suggest checking the Experts tab of the Terminal subwindow for any output about errors. When I try to compile, I get an “EX4 write error”. Any suggestions on how to change that? Please make sure that your MQL4 folder is writable for SYSTEM user. At what point does that happen? Could you please show a screenshot? That’s really strange. Try reinstalling MetaTrader. I have read so many forums on this and watched you tube videos on how to set up the MT4 Indicators. I have followed every instruction word for word. But when i reopen my MT4 it doesnt show the indicators that i have added that should be in the Navigator of MT4 when its running. 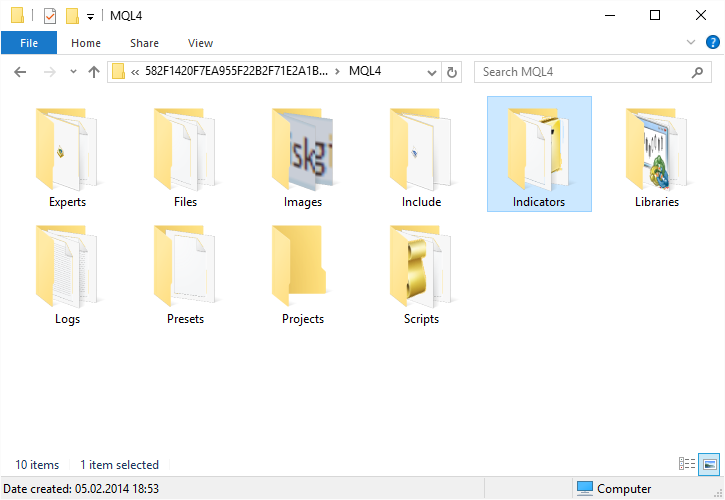 I click on the “Open Data Folder” click on “MQL4” then on “Indicators” and my Indicators are inside it but unzipped. Each Indicator shows a logo/ icon of a zip and a creamy back page. Does anyone know what i have to do to get these indicators to work ? I thought by following the same instruction on every MT4 self help site that the files automatically unzipped when copied and dragged into the indicators. Any suggestions would be greatly appreciated. 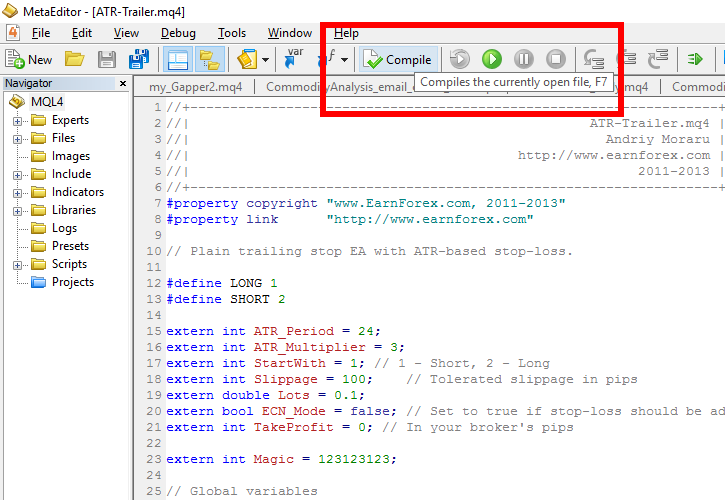 Try opening the .mq4 file and compiling it in the MQL Editor. Does it give any errors? Do you have office or agent in Nigeria? No, I do not have an office in Nigeria (or any other country if we are at it). Would you want to come to an office to talk about installing MetaTrader indicators? What I do with the .mqh file that comes with the indicator PositionSizeCalculator_Main? Same thing you do with the .mq4 file – copy it to MQL4/Indicators/ folder. When I compile the marketprofile indicator I get a warning “date literal string is incomplete” line 36 column 34. Not sure why but it will not give me the ex4 file. Then if I click resume debugging, it the indicator popup comes up in a completely different MT4 platform. I can’t get it to come up on the terminal I am using??? That warning is OK, you should be getting it. To get .ex4 file, make sure you click Compile (F7), not Start/Resume debugging (F5). 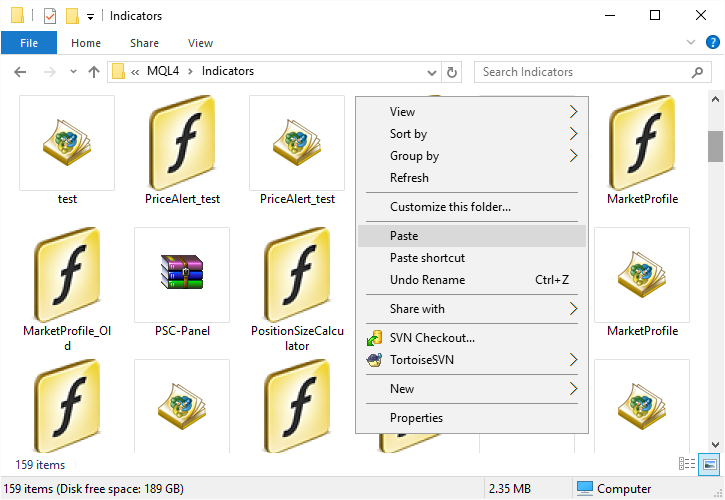 It looks like you are missing a file – PositionSizeCalculator_Base.mqh. It should be in the same zip-archive with PositionSizeCalculator_Separate.mq4. Just copy it to C:\Users\lenovo\AppData\Roaming\MetaQuotes\Terminal\62135AE44FDEC7F2E17CC7982861DF10\MQL4\Indicators\. I hope this site is still being monitored as I cannot get the EXE file to load to the charts. I am using Axitrader MT4. I have tried on 2 different Broker platforms. I have previously had no trouble installing EA’s etc. I have both the MQ4 & Ex4 files in Data Folder/MQL4/Indicators. When compiling the MQ4 file there does not appear to be any way of SAVING it but nevertheless it then appears in Indicators folder. When I say I cannot attach when dragging the file onto the chart or “Attach File” it does NOT open the window with PSC – Trader, just nothing. First, it would be useful to get clear with what you are trying to accomplish. Are you trying to install an expert advisor, an indicator, or a script? Second, are there any errors when you compile the program? Lastly, if you are trying to attach a PSC-Trader script from the Scripts section of the Navigator subwindow, then it should not open any windows. Scripts are not attached, they just execute and that’s all. For example, PSC-Trader only serves to open trades based on Position Size Calculator indicator. Thanks for the tutorial! Very clear, and it worked clean & green first time. Clear explanation, thanks, but for one indicator I’d like, it doesn’t work. It’s Semafor. I found and downloaded the script (.mq4) and followed your directions for MT4. Compilation appeared to take place smoothly, and its name showed up in the Indicator List. But when I try to “attach to a chart”, nothing visible takes place. I thought at first that I needed to change its colors (default=black!) but that too made no difference, and when I tried again I found it had reversed my color choice and reverted to black. Even changing the chart background color reveals nothing of Semafor. Any clues, please? – might I have gotten hold of a rogue version, and if so where can I find a correct one? Could you please share a download link to the indicator so I could check it? That’s not an indicator. That’s an expert advisor. See this tutorial on EA installation. Thank you! I thought it might be a rogue. Finding and downloading this indicator is quite confusing. Dolphin, for example, advertises that they offer it but when I got their set of hundreds, Semafor was not among them. Eventually at http://www.forexfactory.com/showthread.php?t=215369, there was a download link attached to a post by contributor mt2414. I downloaded USDX for MT5, and complied no problem. I’ve got all the required USD currency pairs open, but when I attach the USDX indicator, it shows no candles/MAs at all. I’ve tried attaching to all the required USD currency pairs, still same result. I don’t know what else to do! If anyone can help it’d be greatly appreciated. What does it output in the Experts tab of the Terminal when you attach it? 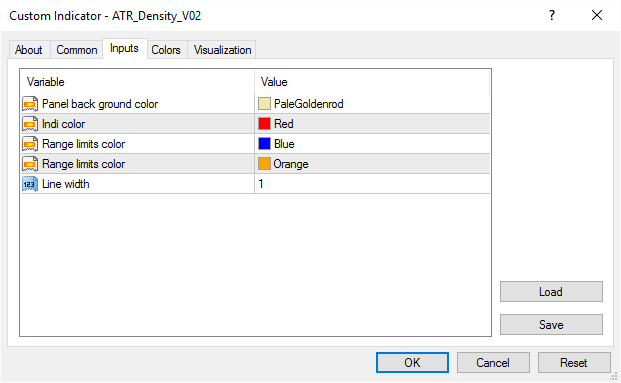 Try bringing up the Indicator’s settings (Ctrl+i – USDX – Properties) without removing it. Then simply click OK and Close. It will force it to redraw. Thanks again, but no dice. It does redraw as you stated, but still nothing. Try switching the timeframe on all charts to M1 and then scrolling them back in time as much as possible. This will load more data. Then try to redraw the indicator again as I have described above. Thank you! That’s sort of worked. I’m happy it has, but please don’t take this the wrong way it only works for M1. I’ve tried all the other time frames using your recommended technique and its back to nothing. I don’t trade the M1 unfortunately. Is this progress though? Is this a step in the right direction to having the USDX working properly? Your thoughts/advice always appreciated. I am not sure. It works without all those extra actions in my platform. Which broker and server are you using? I don’t know which server, but I’m using LiteForex MT5. By the way, I saved the Profile when the M1 displayed, then exited. When I opened again, I was back to no display again, still in M1. Is it LiteForex MT5 demo or live account? Its in demo. I always demo for new strategies/indicators before possibly going live. Thanks for the .gif and your time to register with LiteForex to run a test. I’m not sure why compared to you I’m still getting this issue. I’ve always had the Forex Full Market Watch which obviously includes all the USDX required pairs. I noticed in your .gif you didn’t have the USDSEK chart open, so when I closed it the USDX loaded properly in the Experts tab. But only on M1. Any Time Frame higher and the USDX refuses to load. Although even on M1 I have to scroll backwards quite a lot to see any USDX candles. Most of the time its flat. Is that just due to the USD lack of movement? You do not need the charts – just the symbols in the Market Watch. Yes I did, thanks. I’m not sure why the issue persists, but its OK. I’m not reliant on USDX to trade. I was just accessing it for potential use. Audriy you’ve been great, but I rather not take up more of your time if that’s OK? I’ll be fine! I installed MP on mt4 & mt5 last year and they worked fine. I accessed my mt4 & mt5 platforms today and they do not appear. I deleted them and re-installed them but nothing .. re-installed the platforms but nothing. Please help .. Thanks. What exactly does not appear? Is the MP missing in the indicators’ list? Or is that the chart objects that fail to appear when you apply the indicator? Hi. I downloaded & installed the Forex Position Indicator. I was not able to attach it to my chart nor drag it to my chart for it to open. So I opened up MT4 Editor, & hit the compile button. In the terminal it said file could not be open. What am I doing wrong? Thanks in advance for your help. I don’t quite understand what you did and what result you’ve got. Please describe the problem precisely. In My MT4,Open data folder is not available, what should i can do ? I have never heard of it being unavailable. You can try installing some other MT4 platform then. You do not need WinRAR to open zip files. Windows can do that. To start using the indicator, make sure that you copy both files (ChannelPatternDetector.mq4 and iChartPatternDetector.mqh) into /MQL4/Indicators/ folder. Make sure you are compiling ChannelPatternDetector.mq4 (NOT iChartPatternDetector.mqh). The indicator will then appear among custom indicators in the Navigator subwindow of your terminal. When i compile it I get 91 warnings , could you help me to fix that? What are you compiling? Normally, warnings should not be a problem. I followed the instructions to download and install the Position Size Calculator and it is showing in my indicator list. When I try to add it to a chart but nothing happens. It is not showing up on the chart or is it in my indicator list I already have on my chart. What does it say in the ‘Experts’ output window of your Terminal when you try to attach the Position Size Calculator? Double click the stop-loss line to select it before trying to drag it. Entry line cannot be moved if Order type is set to Instant (rather than Pending). Hi. I have installed Position Size Calculator (v.2.17) and also PSC-Trader. When I try to execute PSC-Trader script nothing is happening. No new order. I Experts window I have just one error – trade operations not allowed by settings. And after that info : Execution failed. Error 4109 – trade in not allower in the expert properties. What sould I do, thanks ? You should enable automated trading via Tools->Options->Expert Advisors->Allow automated trading. Worked ! Thank you ! good day Andriy. When I activate the script for the position size calculator it returns an alert “position size calculator not found” is this because the market is closed? and if not why what could cause it? Allow automatic trading has been activated. Do you have Position Size Calculator indicator attached to the same chart you are trying to run the PSC-Trader script on? I downloaded a position size calculator from your site and have repeatedly tried to install it on my mt4 platform but without success. I followed all the outlined steps. What kind of problem did you encounter when you installed the indicator? Hi, I managed to compile the mq4 with no errors but I seem unable to copy and paste any of the files into Indicators folder on MT4? I right click and paste and nothing happens. I closed MT4 and opened again, tried refreshing but nothibg is showing in my Custom. I’m on a Mac. Thank you, hope you an help! Could be some MT4/Mac compatibility issue. Try checking your file/folder permissions.